I bought Bentley (AKA Naturaliste https://www.youtube.com/watch?v=ZpuhfZDbGs0 ) when he was 6 years old and 6 months off the track. During the 4+ years I owned him, we worked through numerous health and soundness challenges. 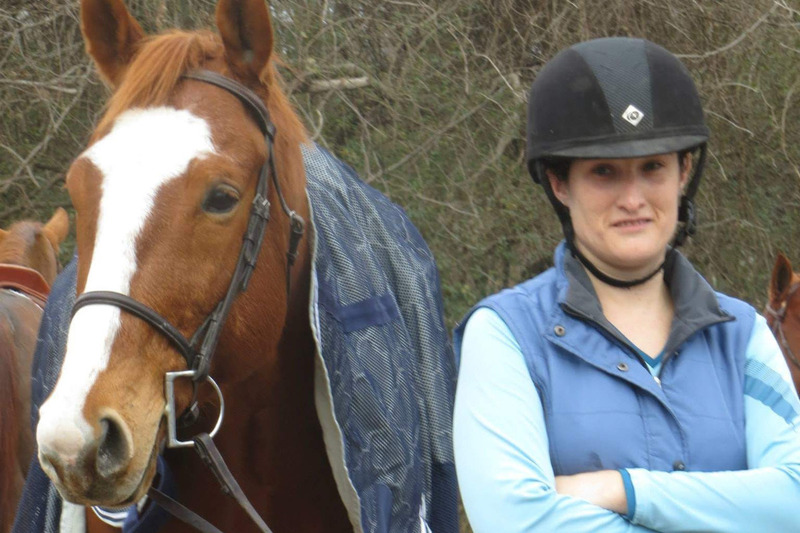 Through it all, Bentley was a sweetie who loved nothing better than just being with me.We had periods of soundness but, despite thousands of dollars in treatments, he just couldn’t stand up to even a low level of flat work. I discovered through contact with Doug O’Neal, his former trainer, that he had a similar soundness history during his racing career, with frequent periods of lameness. Bentley needed a quiet place to enjoy life without the demands of riding. I found a woman who had a horse on her property that needed a companion and was interested in taking Bentley. She visited with us here at the barn where Bentley was boarding. I explained all of Bentley’s medical history and my concern that he might not be sound, even trail riding. 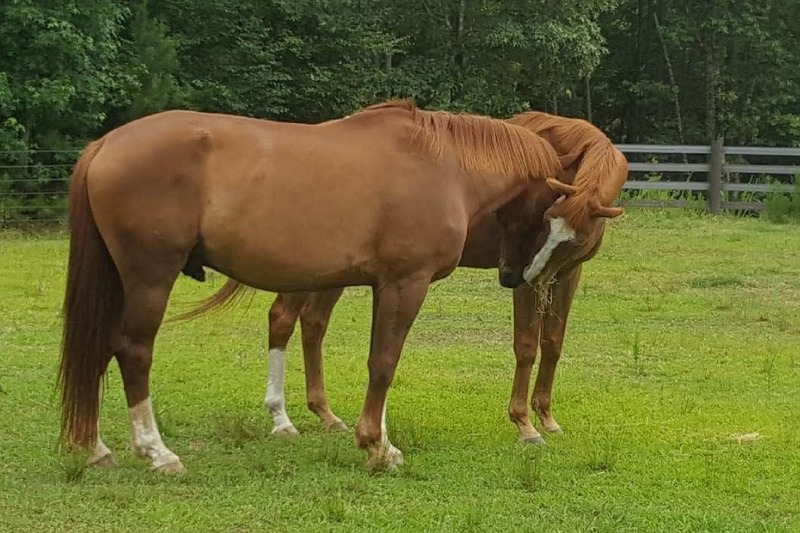 She said that she understood his limitations and would be happy if he could just be a companion for her gelding. 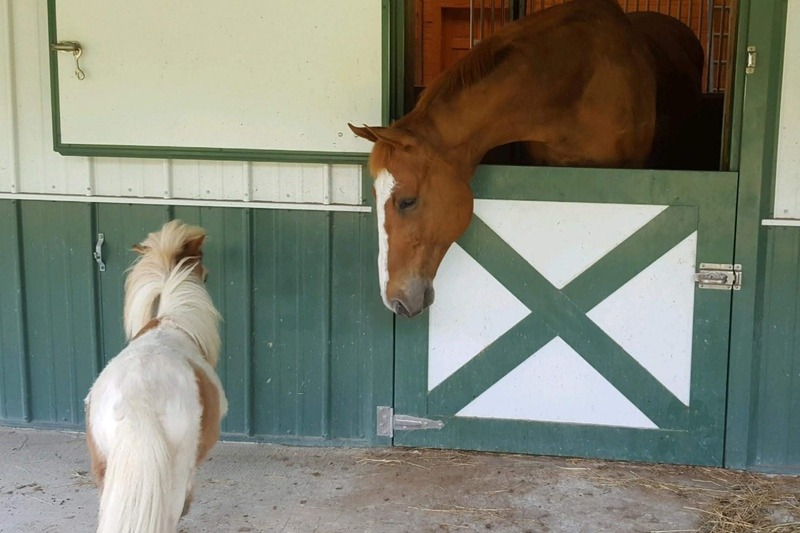 I visited Bentley the next day at her barn and, though rustic, it seemed that it would be a good life for him. I heard from her several times with updates and assumed that all was going well. Last Thursday, through an out of the blue email expressing interest in buying Bentley from an auction in New Jersey, I learned that he wasn’t in Virginia. This rocked me to the core. I never knew the person I gave him to, didn’t have him. I immediately contacted my trainer to see if she thought it was Bentley. Much to her surprise, she agreed it looked like him. We cried and could not believe the horse we loved and cared for 4 years, could have fallen into such poor circumstances. My trainer contacted the sale auction, where he was advertised as a 2’ lesson program horse. This was completely false as he was never sound enough for me to jump. We gave him away as a companion horse. She then learned he was available for purchase for $1580.60. 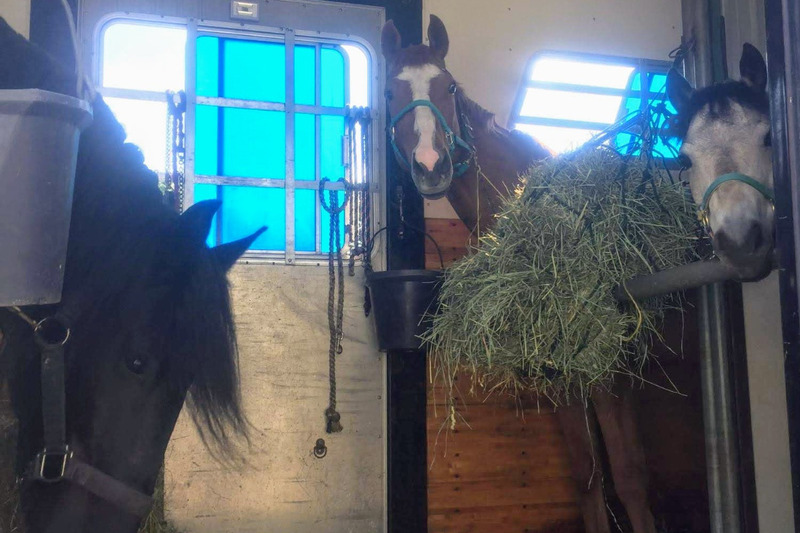 When she tried to offer less, the seller said it was not negotiable as he was in the kill pen until Saturday and would bring meat market value of $1580.60. When I learned he was in a kill lot, I was beyond devastated. This was rapidly becoming my worst nightmare as a horse owner. We only had a few days left for me to rescue him. I love this sweet boy and he deserves better than going to slaughter with all the mistreatment that goes along with it. We immediately pulled together and purchased Bentley to rescue him from these horrible circumstances. Everyone said they would help me, but I did not fully comprehend that, beyond his purchase, this would be the beginning of a much longer story with many more expenses to return him to health and home. I paid for him the same day. More of Bentley’s recent past began to unfold. He was at the auction house for 4 months. That meant that he had been there since November having only been at the place where I left him for a very short time. Despite his emaciated condition upon arrival, the auction house thought they had a good horse that they would be able to put weight on. Bentley had also contracted strangles while he was with the “nice old man” and was very sick when he arrived in New Jersey. 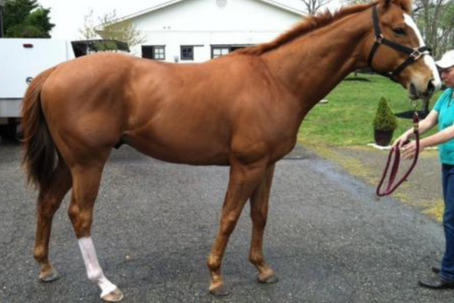 Even with all his health concerns, they believed they had a nice riding horse, and a famous one since he has a track record at Delmar, who would fetch a fine price at auction. The current picture is after 4 months of “fattening up”. 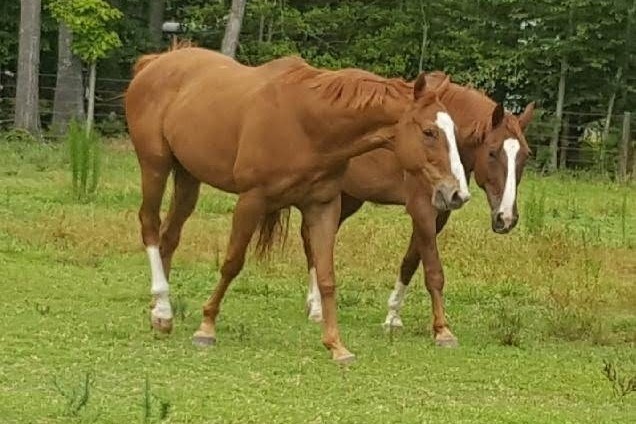 After many attempts to sell him at various sales, it was determined they could not sell him for the money they put into him, He was then moved to the kill pen the very morning the prospective buyer emailed me. So we rescued him and had to pay a shipper to take him to an animal rescue in NH called Hidden Pond Farm, who so kindly helped us in a jam. Now the expenses really begin to add up. Bentley must have a minimum 2 weeks in quarantine so that he can come back to the barn in VA. That’s another $800. His feet are in terrible shape so he’s already had a visit from their farrier. Then there’s worming expenses to get him back on par, a vet to examine him, treating gastric ulcers and then shipping from NH to VA. He will come back to stay with me for a long as possible. I have already purchased another horse, so it is also a matter of now suddenly paying additional expenses when I had not budgeted for that. Foolish as it may seem, I could not turn this poor horse away from a life I had been promised would be good. 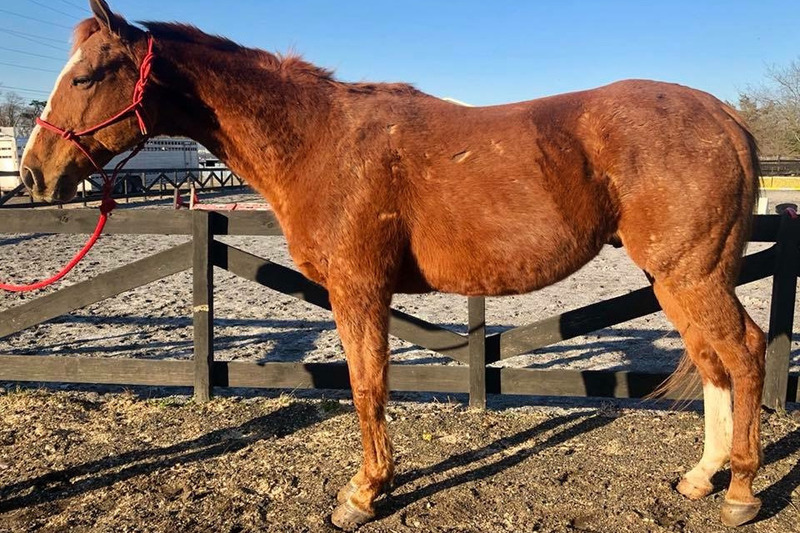 I cannot begin to express how sad I am that I put him in this situation – I promised him my love – I trusted I was leaving him with a loving new owner, 25 acres to roam and not to be in pain working. She made me break my promises to him. I am crushed. He is the sweetest horse in the world. I love him and will never allow this to happen to him again. Please help me bring Bentley home – these expenses are quite a shock for me. While I have purchased him, I have to pay off the charges on my credit card. Only at the beginning of a long process, I am up to $3500.00, with many known and unknown expenses to come. Thank you so much for reading Bentley’s story and helping him to come home to our loving care. Today is the first day of Bentley's adventure at Fox Wire Farm in Toano. New friends, both large and small. I know this will be the wonderful, forever home that you deserve, Bentley. Great News! After 3 ½ months and over $8000, not to mention doubts that he’d ever be cleared to come back to Virginia, Bentley is home in Toano!!! He looks terrific and his BIG sweet personality is the same as ever. I have so many people to thank for this team effort. The amazing folks at Hidden Pond Farm Equine Rescue for their extraordinary hard work to keep Bentley safe and happy. Tara Best and everyone at Stonehouse who held my hand, dried my tears and propped me up through the ups and downs of this LONG, emotional, wallet draining process. The many folks, both near and far, who supported Bentley financially and with acts of kindness. Drs Bartol & Gabour who ensured that Mr B was totally clear of the infections he contracted while at the auction barn. Last, but certainly not least, my dear husband, John, who uncomplainingly paid the bills as they rolled in all too frequently. I finally got an update on Bentley this afternoon. Looks like he'll be hanging out with the good folks in New Hampshire for another month or so. He is doing really well, although I'm not so sure how he feels about 4' of snow. He's a southern boy at heart. Over the next 4 weeks, he'll see the vet once a week for tests to make sure he's up to traveling back to Virginia. At the moment, I'm not sure how much this will add to our costs, but I'm sure it will be considerable with board & the vet. Many thanks for all the kind thoughts and financial support for this sweet boy. Had FaceTime with Mr B today thanks to Jessica Craig who dropped in on him in New Hampshire. He was looking good and very happy to have a visitor. He should see the vet soon for a thorough physical. Thanks to all Bentley's supporters. Please keep sharing.